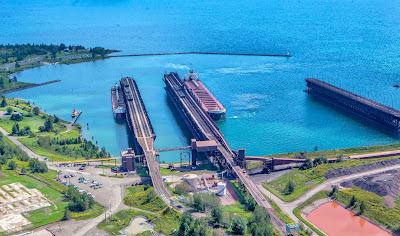 I ran across this image from my archives that shows how boats dock at the ore docks and also the tight area that the boats must maneuver. Nice pick. Love watching the 1000 footers do this. Wow, I would love to hang that on my wall. But I suppose I'll settle for it as a wallpaper on my computer. Now THAT would be a stud spot for a webcam!!! On one end of an ore-dock, pole, or structure. Watching a turn from a higher location, then sliding-up to the giant dock.....wow! Wish I had a bunch of $$$ to donate!